I’ve been collecting vinyl records for around twelve years now. So as a musician myself, I’ve obviously always dreamed of putting my own music to wax. So when my band went into the studio to record our second album, we wanted to make that dream a reality. We were able to do it, but not without going through a long and tedious process. And with the undeniable vinyl boom upon us, it opened our eyes to the ins and outs of the process—as well as its many frustrations. Whether you’re a band looking to press your own album or a music fan getting frustrated with delayed release dates, these insights can help you understand and appreciate the process a little more. Once upon a time, making music required a lot of space. Music was recorded onto large reels of tape. When the tape ran out, so did your music. With the advent of the MP3 and the exponential increase of storage sizes, many artists have written music without any time constraints whatsoever. Musicians and producers can store their recordings in a cloud archive, allowing them endless space to save recordings. But if you’re dealing with a vinyl record, it’s a whole other ball game. A vinyl record is a physical thing, and therefore is constrained by its own dimensions. The grooves have to maintain a certain amount of distance between each other or else they interfere with the grooves on either side of them. For example, a 7″ record playing at 45 RPM—the standard for a single—can hold around four minutes of music per side. A 12″ record at 33 RPM—the standard for a full-length—can hold about 22 minutes of music per side. These time limits have prescribed the typical lengths of songs and albums across pop music history, but today’s musicians often take it for granted. Our first album was sixty minutes long, and the way the song lengths were divided, pressing it to vinyl caused us more headache than it was worth. When we wrote the second album, we used the vinyl template as a guideline. We intentionally ordered the tracklist so that it would play in two separate twenty-minute sections. The limitation was frustrating at times—we had to cut out some passages that we really enjoyed, and we couldn’t let certain songs jam out as long as we wanted to. But in the end, it was worth it. 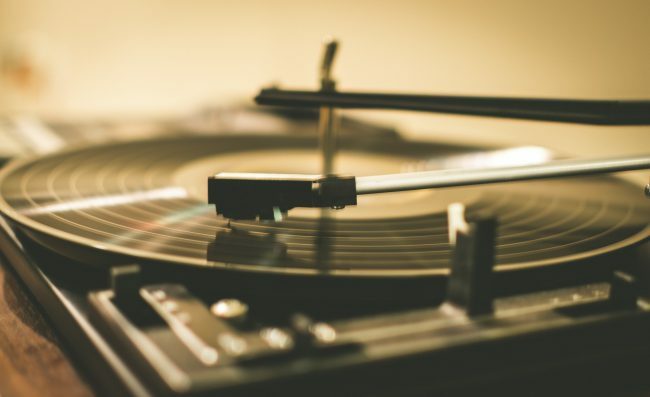 While we’ve been in the middle of a technological explosion, vinyl manufacturing has been largely unchanged since its heyday. It’s a simple enough process. Music is fed into a specialized cutting stylus cuts across the surface of a blank disk, etching the grooves in as it goes. This is called the master. The master is used to create stamping plates, which are an inverse of the master. The plates are set into place and used as a mold to create copies of the master. Simple though it may be, this process requires very specialized equipment. And for a long time, no one was making those presses anymore. Even in disrepair, a vinyl press could cost tens of thousands of dollars. A few companies have begun making new record presses, but a single unit sells for almost two hundred thousand dollars. Most pressing plants are still using older machines, which are prone to breakdowns and maintenance issues, which contribute to all of those delays. Many people balk at the price of a new vinyl record. Many reissues of classic records by Led Zeppelin, the Beatles, or Nirvana carry a retail price of $25 or more. Having self-released our own record, I can assure you that most of those prices are fair. The base price for pressing our 100 records was $1,400. That didn’t include printing for the sleeves, mixing and mastering, or lyric sheets. And most of that price is completely justified. The raw material might be very cheap, but when you consider the costs of purchasing and maintaining the presses, creating the stamper plates, stuffing the sleeves, and paying their employees to do all of this work, the prices add up quickly. Because the vinyl itself is so cheap, the per-unit price drops significantly on longer runs. In many plants, pressing 300 records isn’t much more expensive than making 100, but if you can’t push those units, you’re stuck storing them in your closet for the rest of your life. Most artists who do a vinyl release don’t do so to make a profit—it’s a labor of love. If they break in, that’s all they can hope for. Between putting down our deposit to getting our records in hand, my band waited a full five months. And compared to a lot of my other musician friends who have done vinyl pressings, that was pretty quick. A couple of years ago, I waited nine months for a record that I preordered from my favorite band. There’s an unfortunate combination of factors at work here. While demand for vinyl just keeps growing, there are only a few plants in the world. In 2014, there were only twenty plants in the United States. While new plants have been opening lately, it has not yet relieved the pressure on existing plants from major label reissues, Record Store Day exclusives, and a growing number of underground bands pressing endless color variants. It is getting better though. Besides the new plants opening, many existing plants are expanding their operations to increase productivity. But that change is coming slow. And until then, we’re all going to have to be a little patient. Pressing an album to vinyl isn’t quick, easy, or cheap. It’s a hassle by every metric. But when you have the finished product in your hands, there’s absolutely no substitute. There’s something magical about holding a record with your own music on it that you simply can’t from a CD, let alone from downloading an MP3. And in that moment, you forget all of the frustrations that led to that point. Because it’s finally here, and nothing can replace that.